The Luxury Range silk duvets below are the best of the best, filled with luxurious 100% natural and hypoallergenic absolutely top grade long-strand mulberry silk that has been hand-stretched into the duvet casing. Each silk duvet is then carefully loop sewn by hand through the duvet casing to prevent movement of the precious silk interior. Hand loop sewing rather than machine "pattern" sewing is used to avoid crushing and damaging the silk. Using this method also ensures that the thermal insulating properties created by the air enclosed between the fine silk threads is kept in place. This greatly contributes to making Silk Bedding Direct's Luxury Range mulberry silk-filled duvets so wonderfully light and comfortable and helps in regulating sleeping temperature over a wider range than other duvets. Silk Bedding Direct has become known as the provider of the very highest quality mulberry silk-filled duvets due to seemingly small attentions to detail like this that make a big and noticeable difference to the finished duvet. Mulberry silk-filled duvets are our specialism, we promise you won't be disappointed. These are the very best of the best of mulberry silk-filled duvets. All orders are covered by a 14 days full money-back guarantee. Return for any reason, we'll even pay the return delivery fee. 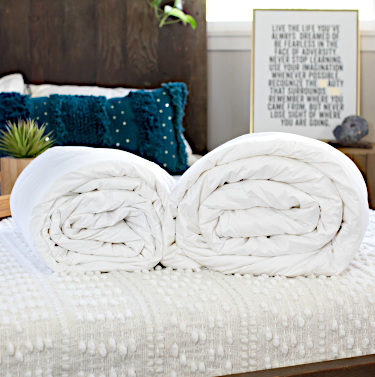 We're sure you'll love your silk duvet! There are also some great offers in our sale for Luxury Range mulberry silk-filled bedding sets - combinations of luxury silk-filled duvets, silk-filled pillows, and/or silk-filled mattress toppers. All silk bedding is dispatched from within the UK on same or next day of ordering and is OEKO-TEX Standard 100 certified. Worldwide delivery options are available. 150cm x 120cm / 59" x 47"
200cm x 150cm / 79" x 59"
240cm x 220cm / 95" x 87"